A high luxury home or office is a lifelong investment to keep safe, being the primary target for burglaries. Safely locking up a large expensive home can be worrisome whether it is throughout a work day or for a holiday. More often than not a burglar alarm can go ringing for hours without neighbours or police going to investigate, in these cases a physical barrier to deter and prevent forced entry should be installed. 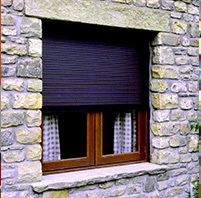 Security Shutters, Window Shutters and Grilles are discreet security focused products that are out of sight when not in use but provide a visible resistance to burglars and effective barrier to crime when used. 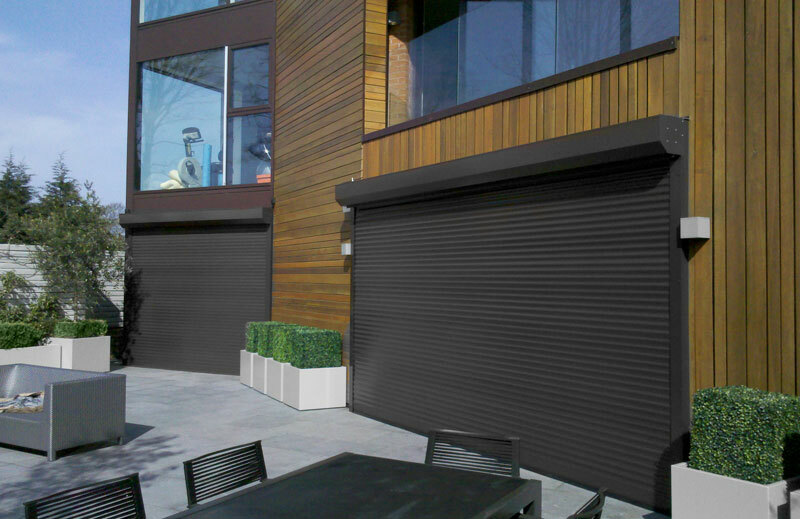 A security shutter can blend in with an existing building with a range of colours and roller hoods to be compact. 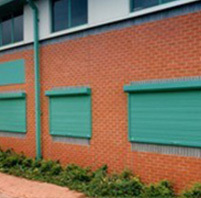 Commercial security shutters are all along highs street shops, however these are not always meant to compliment the building, cheaper security roller shutters are manufactured from low grade galvanised steel with short shelf life from corrosion, wear and tear. Aluminium security shutters have high quality lath sections and when manufactured properly, offer great levels of security and look good with a more robust finishing and corrossion resistance. Electionic operated security shutters mean minimal handling is needed on installation and over the best for daily operational conveniance, being able to lift every shutter around a building at the same time rather than going from room to room opening each one individually. Samson Doors offer many different types of manual and electric operated securty shutters depending on the level of securty you require. 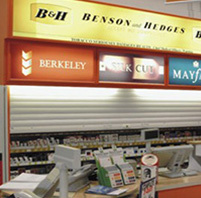 Low security as a visual deterrent, or higher levels of security for a shutter that has been tested for forced entry and holds insurance approved certification. Aluminium shutters are availble in almost any RAL or BS colour and all can be manually or electronically operated to suit requirements. 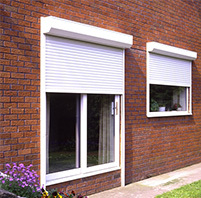 The shutters are also always made to measure for a perfect fit and optimum security and resistance to force. The SWS UK security window shutter range has been developed, tested and perfected over many years to provide stylish solutions for your physical security needs. Lightweight and compact, the SeceuroScreen 1500 uses CFC free foam filled aluminium slats, offering insulation and sound deadening. The compact design makes this security shutter suitable for installing within the reveal, particularly popular in domestic applications. Or alternatively, for use in higher security applications, the SeceuroShield 3800 is manufactured from exceptionally strong extruded aluminium, can be mixed with ‘vision slats’ and powder coated in a large choice of special colours when required. This is one of the strongest security shutters for small and medium sized applications in either domestic or commercial premises. It is available in various manually operated forms or electric tubular motor operation. Manufactured with aluminium head box and guides for higher grade applications and easier installation, the SeceuroShield 7500 is the classic steel security shutter or security window shutter. Perfect for medium security office, commercial and industrial applications the scrolled slat profile is a familiar sight, now updated with a quality powder coated finish and a choice of many colours inside and out and including the hood cover and guides of course. No matter which security window shutter is best suited to your requirements it can meet many of today’s threats to property and person. Protect your property and contents – don’t leave an open invitation to intruders! There are many more types of shutters available but in order to obtain a price from Samson there are some simple measurements required and a decision as to where the shutters are to be positioned. It is normal to install any security shutter to the outside face of an aperture to protect the door or window and offer the least obstruction to the aperture when the shutter is open. 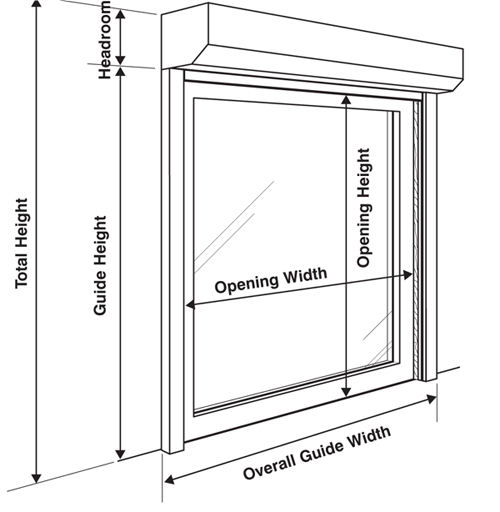 Measure the door or window aperture width and height and take some notes on the side room and head room available before emailing or calling us as this will give us most of the information required for a price. You can of course go to our online shop and see prices for yourself once you have worked out the best type of shutter for your application.